Final files have been sent for two new Beachhouse Publishing Hawaiian Legends for Little Ones books by Gabrielle Ahuli’i. One of them is Hi‘iaka Battles the Wind. Pele's sister, Hi‘iaka saves Waipio Valley from the ravages of a powerful wind. 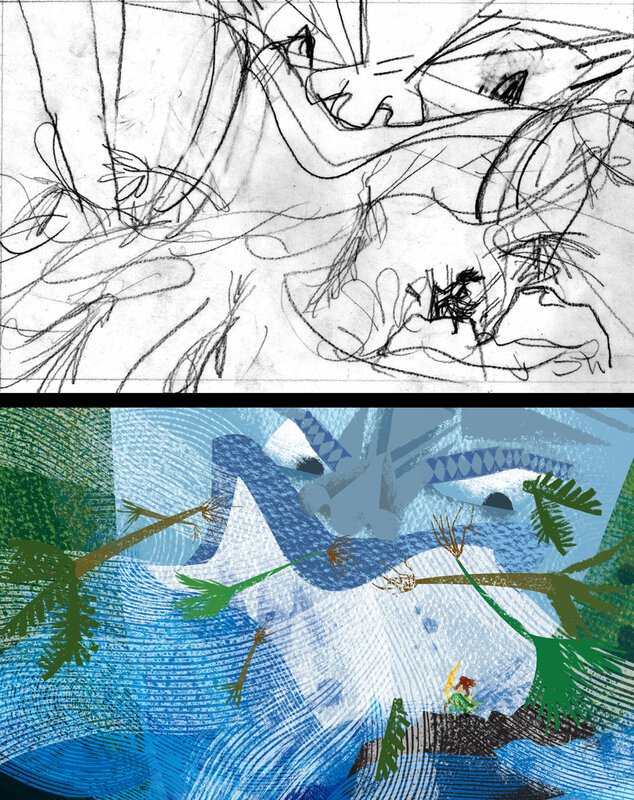 Here's the original sketch next to the final image. In my sketches, I never show texture. I have ideas swirling in my head about what I might try, but nothing ever comes together until I start playing with the digital collage. Even I am surprised at the happy "mistakes” that happen while I explore. I had fun playing with the contrast in size between Hi‘iaka and the wind. Her size belies her power! You'll have to get the book to see what happens next. Working on the images was a great excuse to revisit a favorite place. On our January trip to Hawai‘i Island, we walked into the valley. The road down is only a mile, but the grade is 45% in sections!